Equalized Assessed Value increased in Uptown $23,615,746. How much did it cost to get an increase of $26.4 million? All of the Public Investment is tax money, regardless of the source: $129,000,000. This was declared a great success last night. The Council voted to extend the TIF because three parcels have yet to be developed. They will begin sharing the increased EAV with the other taxing bodies that haven’t had any benefits so far – like Unit 5. The TIF lost money last year, we don’t know from last night’s discussion where the money to pay off the bonds will come from once other taxing bodies start sharing the wealth. Koos made it clear the TIF did nothing encourage the “luxury” apartments in Uptown. Somebody at the Town of Normal had to approve the building plans and permit. The developer was given the land and Normal rented an entire floor just to get it built. I wonder if anybody questioned $4200 a month apartments? Was that to prevent RiffRaff from living in Uptown? Koos did make the point that low and moderate income housing was the goal of Uptown 2.0 – the other side of the tracks. If anyone present saw the irony in that statement, they didn’t say it publicly. The Library in Uptown 2.0 is on hold, nothing is happening with the rest of the plan either. The Town didn’t get a Tiger grant for the underpass. Normal will hand out $3000 grants to buy a home in Normal – until the fund runs out of money. Obviously there is a need for affordable housing in Normal. If the need exists, why isn’t a private company building it? Are developers being stopped because they aren’t the “right fit”? Posted in BloNo, debt, Koos, Local, Normal, Taxes.Tagged Affordable housing, Chris Koos, other side of the tracks, TIF, Uptown Normal. Like I have said before… Uptown Normal is really code for Upscale Normal. The elites who run the city have built a downtown that they feel comfortable in….the city moved their offices into a building that has apartments that cost $4200 a month to rent? Occupying luxury offices created by and for our city government elites says it all. And the taxpayers are on the hook for the bill? Uptown Normal is a colossal economic failure. However, people generally view it as a “success” because they compare the aesthetics to what was previously there. When we talk about spending/wasting $90 million (as Tiritilli did), people have historically tuned out. However, the speaker from Green Top (whose employer will likely go under – different story) finally talked economics relatable to the average person. Uptown is artificially pricing people and businesses out due to government central planning economics! Plain and simple. Did anyone catch the comments of Ken from Epiphany Farms talking about per sq ft rent in Normal versus Bloomington? I think he was alluding to 1 Uptown Circle pricing out his new bar/restaurant, which is launching in Downtown Bloomington. Missed that one! Where was that? “I’ve looked at properties in Normal. It’s like at $22 a square foot. I can’t as small business owner come close to affording that. But in downtown Bloomington, you can find deals for $7 $12, $11, $10 a square foot. I see immense opportunity in that,” he said. So much more to write about in this article, Diane. Check it out! They could make a lot more money letting the bars thrive. That’s not the “right fit” for elitists though. Yes Upscale Normal was build by elites for elites….average people with average incomes are really not wanted there and of course businesses must “fit” too. 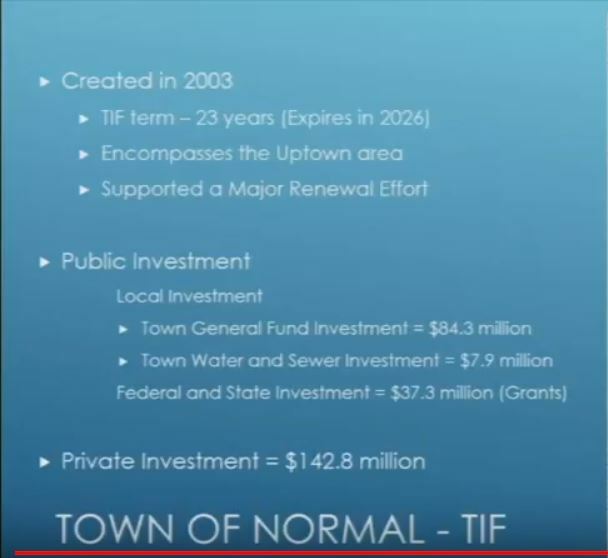 The good old places like the Gallery and Celler were not part of our elites’ vision of the Upscale Normal that they wanted to be in, so they build a downtown like “Naperville IL” with taxpayer money. I guess rich Chicago students and their parents will like it but regular working class people certainly don’t fit. Isn’t it amazing Diane…Tari and his elites would rather lecture the market to score ideological points, rather than embrace the market and the benefits it would bring. Seems to me the market has told them what it thinks about Downtown already. “This is not a time period when we have the luxury of doing nothing or hoping it will work itself out,” Buragas said. ACTUALLY it is not a time period to tax and spend when the people are taxed to death and not responding to what small minded and elitist wannabee Amelia and her ilk want to force on people. Reading the GLT article linked above the downtown success story will come from entrepreneurs with good business plans that follow through which includes embracing the customers that they have of which Renner and Koos will not do as per their marching orders per Agenda 21 mixed use comprehensive plans as their brains are too small to how they themsleves are being brainwashed and manipulated. “Butch Thompson has owned restaurants downtown since the early 1980s”,,,and would like to see the city do something,,,but on the other hand Butch could participate by cleaning up in front of his properties instead of letting the sidewalks out front look like crap accompanied by thousands of staples never removed from old posters, lol. Ever been in a bathroom at Daddios? Disgusting! Carlo Robustelli a 5 year transplant from the Carolina’s doesn’t know squat about this area, nice guy, smooth talkin’ two steppin’ politician, typical gets decent reviews, a wolf in sheeps clothing. What a joke and this guy is on the DT Task Force, only due to political control folks. Move along, same ole, same ole. Looking to move up the political control ladder, paying those dues ya know. Much credit to Kelly’s Bakery and Epiphany Farms people for appreciating and embracing what they have and changing to accomodate the market at hand. Yes the free market really does work. Note that’s why these people are successful, as they find what people want and work in that direction rather than buying into central planning by people that have never heard of let alone been to BN. Exactly. Those that have success and are likely to continue being successful are the ones that buckle down, work hard, adapt to change, and put things on themselves and their business. While the Mathy’s and I may not see eye-to-eye on politics, their businesses have succeeded based on ideas that fit with and accommodate the market. (Not to mention, they are generous with local charities.) Much of the Downtown crowd, however, is living in the past and is waiting for the government to do something. Absent the Mathy’s and Ken of Epiphany, most of the Downtown crowd gets together and whines for more of our money, while not putting their own private capital into play. While I’m not a DBA fan on principle, perhaps they could do matching grants for business beautification or remodels. Carlo and Amelia believe in government control. We’ve tried that. Time for the private sector to step up…or have they sold out to government? They didn’t support the DBA, so all those matching grants will be taxpayer money. There are already grants for facades. There are Enterprise zones and TIF districts. For the past 25 years, the Councils have made poor investment choices that are draining tax dollars. Bond payments for those investments will not be retired for 10-30 years. The Task Force was to come up with funding proposals for their wish list. They failed. Pretty sure Butchie didn’t get into the restaurant business until the mid-90’s when he and his wife first opened Elroys. He has though been in the bar business since the 80’s, for whatever that is worth. EVEN IF you paid ME $4200 a month, there is NO WAY in HELL that I would live in UPTOWN! PERIOD! So why do these chimps think someone will pay THEM that much to live there?? Talk about excessive stupid! Seriously, Students, traffic-ONE WAY, NO major restaurants, NO cultural features-OH but we have a WATER FEATURE (WHAT the heck is that anyway?) AND a roundabout-this is for people who DON’T know how to handle a 4 way intersection! And THIS is UPTOWN?? I’d MUCH rather live in Polebridge, Montana, at least then I could go to Glacier on my free days!! OH, and I MIGHT see a martin once in a while! Or, I could listen to Marmots whistle! Kinda arrogant a graduate student thinks he and his wife deserve to live in Uptown with tax incentives. What happened to living within your means?